What's better than a crock pot meal? Easy prep and delicious food--- yes please! I was looking at the Crock Pot Girls on facebook and saw they had posted a YouTube video for their Taco Stew. All I had to do was brown the ground beef and then throw all the ingredients in the pot. I added some onion chopped into small pieces because I had some leftover from another recipe. That was the only thing I changed. I had to cook it on high for 4 hours since I started late. 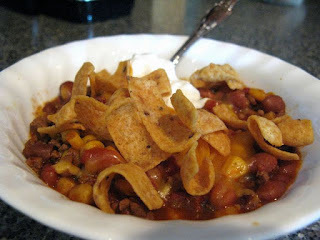 The only thing left to do once it is done is scoop some into a bowl and add cheese, sour cream, and Fritos. Mmmm. Eric even said it kinda tasted like his moms chili. Here's the Youtube video--they have all the ingredients listed at the end of it. That sounds good! I am definitely going to have to try that!